Infiniti Yachts and Dynamic Stability Systems (DSS) have entered into an agreement with Farr Yacht Design to design the new Infiniti 53 racing yacht. Design work and preparation of builder quote packages and pricing for the yacht is proceeding quickly to be ready for a construction start this autumn. The partnership will significantly advance the performance of yachts in the mid-50ft range. The Infiniti 53, equipped with DSS technology, will be uniquely positioned to provide exceptional performance in a wide range of conditions — able to perform well inshore and excel in offshore races. DSS is a retractable foil that is deployed to leeward on a yacht. This foil creates lift to leeward, thereby increasing righting moment, in a similar fashion to adding lead to the keel bulb or crew on the rail. The technology was created by British yacht designer Hugh Welbourn and has been in development for more than a decade. DSS improves a yacht’s all-round performance through being ‘dynamic’: The stronger the wind, the faster the yacht and its DSS foil travel through the water, and, as a result, the more lift and stability the foil generates. Conversely, in light conditions, the foil is simply retracted, leaving an easily-driven hull shape. DSS delivers a yacht that performs well both in light and heavy conditions. Using a DSS foil also reduces a boat’s displacement and, in turn, its hydrodynamic drag, while offering further benefits of reducing bow burying and pitching. 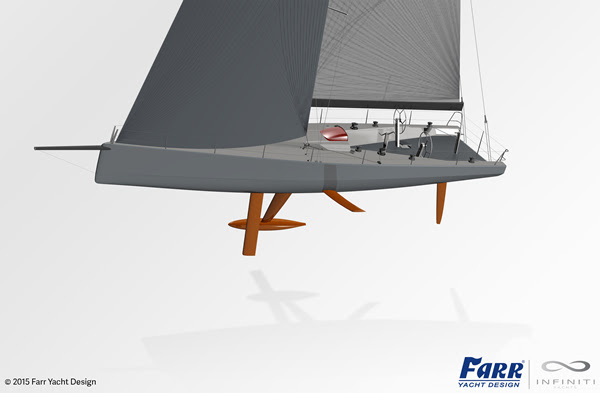 Farr Yacht Design is excited by the performance benefits available from DSS and felt it would be beneficial to both parties if they teamed up. 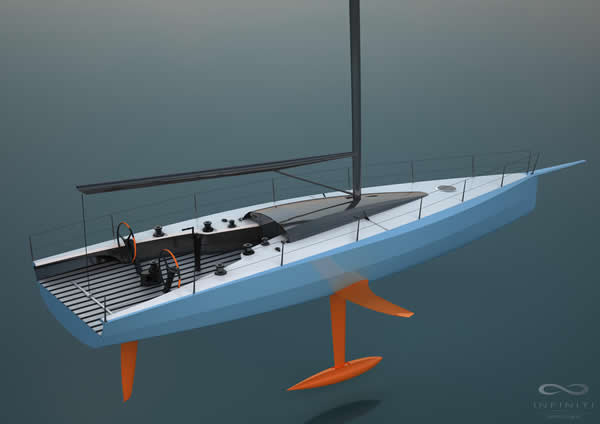 It has already designed canting keel yachts like IMOCA 60s with foils that provide some vertical lift. Ward reckons that fitting DSS, particularly at reaching angles, can provide a performance yacht with a speed boost in the order of 15 to 20% and at reduced heel angles. Fitting DSS has proven to be the single greatest performance-enhancement one can make to a racing or fast cruising yacht. Many performance or racing yachts are now benefitting from DSS turbocharging, including multiple Rolex Sydney Hobart Yacht Race winner, Wild Oats XI, and a new series of Quant Boats in Switzerland. Monaco-based Infiniti Yachts has already built the DSS-powered 36 GT and 46R. Two Infiniti 36 GTs are currently launched and sailing. The 46R, an offshore/coastal racing design, is due for launch at the end of 2015 and scheduled to debut in the RORC Transatlantic Race in November. It is currently being built at the URSA Shipyard near Istanbul. The design features a canting keel and canard. It is also available with a fixed keel, depending on an owner’s requirements or race program. In line with many owner’s needs, the yacht has been optimised to be sailed by a crew of just six, but without sacrificing performance. While the 36 GT and 46R are designed by Hugh Welbourn, the Infiniti 53 will come from Farr Yacht Design, but will harness Welbourn’s 12 years of experience and R&D into DSS foils. The Infiniti 53 will be a slightly larger, modernised version of the Farr-designed canting keel Cookson 50. Since its introduction in 2003, the Cookson 50 has proven to be an unbeatable combination of value and performance; winning or podium placing at every major offshore event worldwide. Farr Yacht Design has developed a very low drag hull form for the Infiniti 53. It can be driven efficiently by a reasonable sail plan even in light air, but has the right balance of static stability from the hull form and deep centre of gravity canting keel, combined with dynamic stability from the foil to give the boat unmatched performance in moderate to strong breezes. As a light, high speed boat the hull has a relatively high beam-to-draft and features a full length chine positioned to maximise high speed handling and form stability. The structure is engineered primarily using carbon and foam cores, making optimum use of materials. The new 53 footer is set to be designed ‘around the foil.’ FYD subscribes to Hugh Welbourn’s philosophy that fitting DSS enables a yacht to be leaner with less hull volume and to carry a smaller bulb than a non-DSS equivalent.